Cecil Briggs photographed c1930 as one of the Bottesford British Legion bowls team. 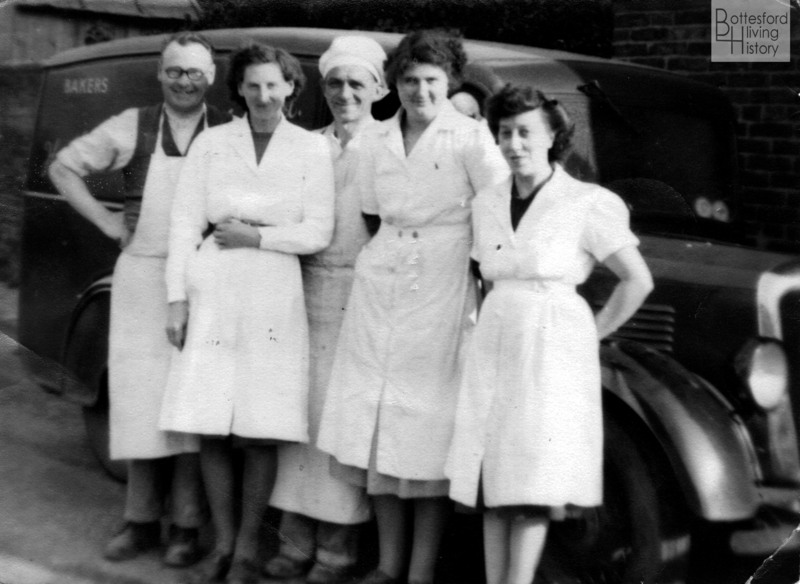 Tom Philips and the workers at the bakery on Chapel Street, Bottesford. Left to right: Tom Philips, Winifred Claricoats, Cecil Briggs, Kathleen Langton, Emily Rayson, in front of the bakery's Morris 12 delivery van. Cecil Briggs wearing his Post Office uniform and with his delivery bicycle, outside his cottage on Easthorpe Lane, c.1970. From the family collection of Mr Jeremy Pedge. 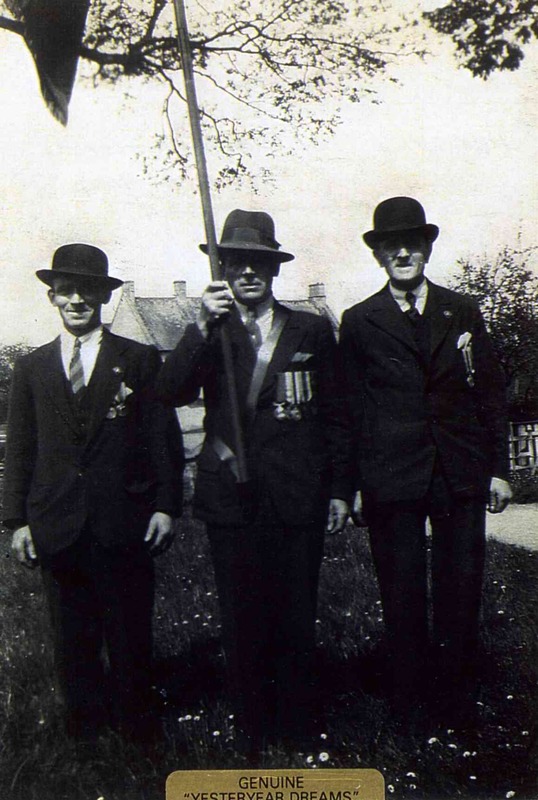 Cecil Briggs is one of the men named on the Bottesford ‘church list’ of WW1 servicemen. Cecil Joseph Briggs, known affectionately as ‘Cis’, was born 21 July 1899/1900 in Bottesford. He was son of Thomas Briggs, a railway platelayer born in 1859 in Bottesford. His mother, Annie Maria, was born in 1861 at Millfield, Nottinghamshire (or at Peterborough, according to the Census of 1911). In 1891, before Harold was born, the family had lived on The Green, but by 1901 the family were living at Bunkers Hill, where the children at home were Earnest (aged 15), Harriett (12), Herbert Abbott (11), Thomas (4) and Joseph Cecil (1). All the children were born in Bottesford. In 1911 the Briggs were recorded as living on Station Road, though this may well still have been the same Bunkers Hill cottage that had been their home in 1901. Cecil, aged 11, was a schoolboy. His brother Herbert (21) was at work as a railway clerk, and there were two younger children, Lilian (aged 9) and Clarence Frank (aged 7). He started work as a trainee baker at Philips bakery on Chapel Street, Bottesford, during the early part of WW1, but left to enlist in February, 1917, when he was (almost) eighteen. He returned two years later, after his discharge from the army, and resumed his work with Mr Philips and the bakery’s later owner Mr Simpson. Joseph Cecil Briggs enlisted in Nottingham on 26 February 1917, aged 17 years and 220 days, but was not medically examined until the 23rd August. At his medical examination on the 23rd August, 1917, his age was 18 years 33 days. He joined the Sherwood Foresters, Service Number 92797. He joined the 13th (Territorials) Reserve Battalion at their depot at Derby, and by November, 1917, he was in the 6th (Territorials) Battalion. [transfer to 6th not in pension record. 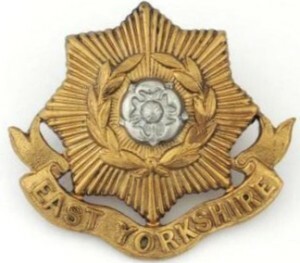 He was transferred twice more during his relatively brief military career, firstly to become TR/51222/2 of the 52(YS) Battalion, West Yorkshire Regiment, then becoming 41695 Private, 11th Battalion, East Yorkshire Regiment. On the 24th August, 1918, the Grantham Journal reported: “Private Cecil Briggs, East Yorks Regiment, son of Mr. and Mrs. T. Briggs, Bottesford, who has been wounded in France, was sent to the western front during the great German “push”. He is injured in the arm, but is making a good recovery.” He had been withdrawn from the fighting with a badly injured arm. According to his WW1 Pension Records, Cecil Briggs received an injury to his left forearm on the 28th June, 1918, while serving in France. He suffered a fracture of the radius of his left arm, complicated by ‘staphylococeus’ infection. He was admitted to hospital on the 18th July, 1918, where he ‘made a good recovery, recovering good wrist action’, with ‘no limitation of power or sensory disturbance’, and was classified as an Auxiliary on the 29th August, 1918. Later, he was rated ‘fit for dispersion’ on 22/1/1919 at Bagthorpe Military Hospital, Nottinghamshire. He was transferred to the Reserves on the 2nd March 1919, his home address given as Station Road, Bottesford (his parent’s address), and was awarded a War Gratuity of £27 10s 0d. His war injury left him with a deformed and weakened left arm for the rest of his life. ‘Cis’ Briggs returned to Tom Philips’ Bakery in Bottesford when he returned from the army in 1919. In the second quarter of 1920, he married Amy Cole, in the Nottingham district (therefore not in Bottesford). They had a daughter named Amy M Briggs, born 4th January, 1921. Electoral rolls show that by the autumn of 1921 Joseph Cecil Briggs had moved to one of the cottages at The Green, Bottesford, and was still there in the autumn of 1925. From the Autumn of 1926 until 1929, Amy was also on the electoral roll at The Green. But by 1930, Amy and Cecil Briggs had moved to an address on Grantham Road, possibly in the Bunkers Hill cottages. Cecil carried on working in spite of the weakness in his arm. He was an enthusiastic cyclist, and used to make trips up and down the Vale of Belvoir with his wife, riding a tandem. Their address was still ‘Grantham Road’ when they were recorded in the 1939 Register, admittedly with some spelling errors (Briggs is given as Brigge, Joseph C as Joseph G). Thus, Amy Brigge (Briggs), a married woman born August 7th, 1895, lived with Joseph G Brigge (Joseph C Briggs), a married baker born July 21st, 1899, and Amy M. McCarthy (Brigge), a single drapery shop assistant born January 4th, 1921. 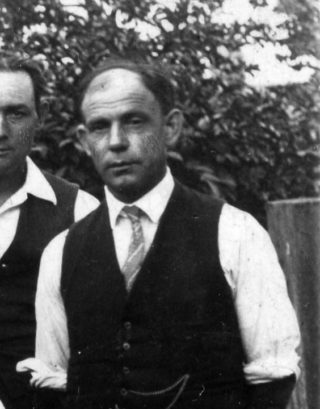 This apparently indicated that Amy and Cecil had married in 1920, and had a daughter also named Amy, who in 1939 was an 18 years old shop worker. The name McCarthy was added apparently in 1946, over-writing the original name Brigge, and was presumably Amy M Briggs’ married name. Cecil Briggs remained at Simpson’s bakery until it closed in about 1953. Mr Simpson’s son, John, remembers Cecil working hard at tasks such as mixing and kneeding the dough in spite of the weakness of his deformed wounded arm. After leaving the bakery, he took a job as a crabe driver at Rushton and Honrsby Ltd, Grantham. Later still, he worked as a post man, and moved to one of the former estate cottages on Easthorpe Lane, Easthorpe. Amy Briggs died in 1961, aged 66, then Joseph Cecil in 1978, aged 78. The National Probate Calendar gives a summary of his will, which states that he had lived at 23 Fleming Avenue, Bottesford, and died on the 7th April 1978. Details of Pte Briggs' medals have not been found as yet.